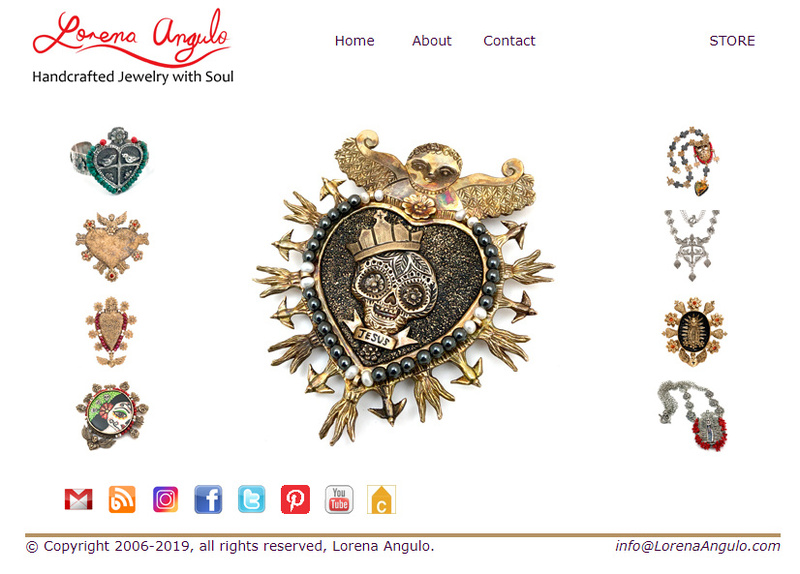 Lorena Angulo: Queen of Hearts Giveaway for Valentine's Day. Hola my wonderful friends !!! I am very happy to organize another giveaway and give the lucky winner one of my one-of-a-kind heart necklaces. Valentine's Day is soon approaching and as a thank you to all of you who have supported me and my work I want to give away a mixed metals "Corazon" neck piece. Bronze clay, PMC Pro, brass, sterling, red coral and pearls. 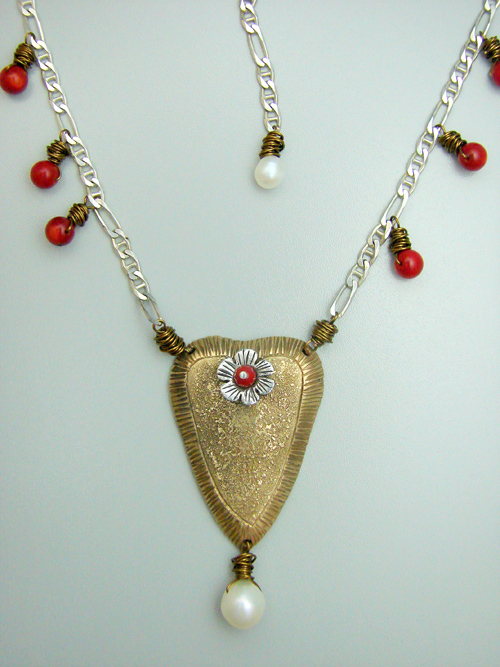 I made this necklace with a hand carved bronze clay heart, after it was fired I riveted a hand formed and carved fired PMC Pro flower (silver) with a red coral bead. 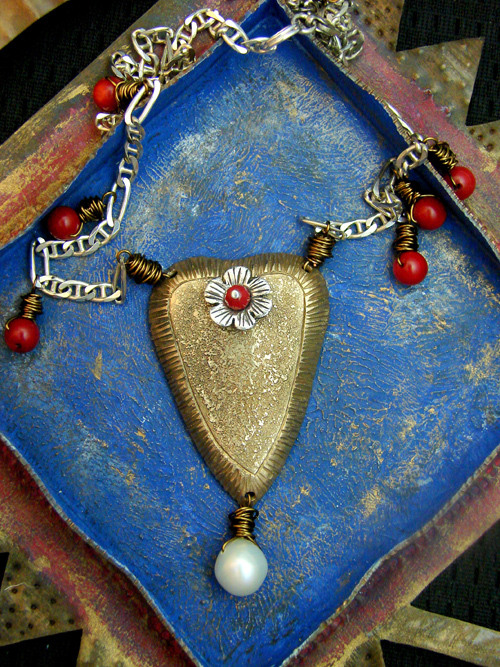 The piece was finished with a sterling chain, brass wire, pearls and more red coral beads. 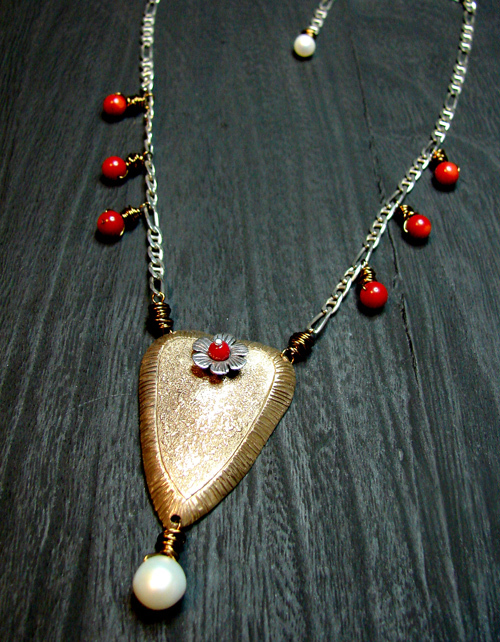 The symbol of the heart is very strong in my work because I have a big admiration for "Milagro style hearts." Hearts (corazones) represent how we love, who we love, passion (for our jobs, family, etc), compassion, and health. When I give away a heart piece, I am wishing the receiver good health and best wishes in their life, love and family. What I ask for you to be able to participate is to follow my blog and leave a comment. Tell me what symbolic meaning a "Heart" has to you. Please remember to include your contact information. Bonus points: You can have more chances to win this necklace if you post my giveaway in your blog, Facebook page or tweet about it. To earn the bonus points you must add another comment on my blog letting me know where did you post it. I will announce the winner on Valentine's day (February 14). Love the necklace. . .want to make it MINE! BE MINE, VALENTINE! Love, Love! And I posted the giveaway on my facebook page. . .but I hope I WIN! Hi Lorena. I'm a follower of your blog. To me, the heart symbolizes love, innocence and POWER! PS: I met you at Adorn Me! last year and LOVE the earrings I bought from you at vendor night! I get soooo many compliments on them when I wear them. Your work is beautiful. wow !! Marlene, I think you really like the heart!! Si, quiero el corazón. The heart means love and love is the bottom line in life. We are here to love one another. Sometimes is not easy and then we need to have faith in God and be an instrument. Thanks for your giveaway. Thanks for sharing your meaning of the hearts Norma!! Thanks for participating and I am happy you have enjoy the earrings !! Are you going to Adorn Me! this year? I posted your giveaway on Facebook and tweeted! Love this necklace that represents love, family, home, and the gift of offering your heart to those you love. This is lovely! Im following (or is that stalking?) I tweeted, and posted on facebook. Hola Lorena! Just became a follower of your work. Your creations are exquisite! I would love to win your Corazon Necklace...please put my name in the hat! I will be posting your amazing giveaway on my blog: http://gesmpccorner.blogspot.com and on Facebook as well. This is a beauty and who would not want to win this! Oh..almost forgot. El Corazon to me is REMARKABLE (God's most finest of creations...pumping blood to all our organs, without it we would be doomed), RELENTLESS (doesn't find rest until it finds what it is searching for...love), and REPENTANT (Through God's goodness we would know how to love one another the way He loves us). The heart is amazing! memories, appreciation--but there is still so much more room left for all that is yet to be. Yes, I adore hearts. They represent the countless blessings in my life. Lorena - gracias for giving me this opportunity to express my feelings. In this way you have helped me down the road toward healing. Abrazos! What a fabulous, generous give-away, Lorena! A heart to me symbolizes everything that the word "love" defines and embraces. I love your heart necklace. I too am from San Antonio, Texas, now living in Arizona. I make polymer clay hearts. Like you, I love the Mexican folk art, the colors are so true and vibrant. 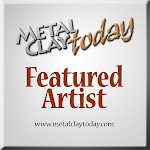 I just stumbled on your blog I find your art is amazing. Thank You Cathy(BizeeBeeCreations), Laura, Lupe and Frances !! Thanks Diana and Rose !! The heart of course means love. It means kindness and gentle spirit. It is also a motif that allows others to connect to a creation coming from their own meaning for the heart. It is ultimately totally personal to the viewer and almost always joyful! Your hearts are wonderful Lorena. I do hope that whoever wins will wear this necklace with bliss! I linked to this post on my facebook status update too. Hearts are for sharing after all! Without a heart we are nothing. For me, the heart symbolizes spiritual love, the sort of love I am to show each individual that crosses my path. So many tangible and intangible ways to share that love. For some years now, I have been on a search for natural rocks and stones that are heart-shaped. It's amazing what you can find when you look down and take notice! Nature has made many hearts for me to find and I am soooo enjoying where all the interesting little paths are taking me. Your heart struck me, because it is very earthy and has an aged look and I am partial to that look. To close, I will mention that your use of the word "Corazon" reminds me of one of my favorite romantic comedies ... "Romancing the Stone." Just shared your giveaway info on Facebook via Joan Furilla - and I am now following you on Twitter, where I also retweeted your info! I posted this on my blog www.pickingpoppies.blogspot.com and on facebook. To me, a heart is symbolic of passion. Not just the physical/sexual passion, but a passion for life - that fluttery heart feeling we get when we are truly excited about an art project, a friendship, learning, etc. Boo Boom, Boo Boom....your heart is making mine beat faster *wink*. It's just beautiful! I tweeted it and I'm leaving a comment. However, where is your subscribe button, my dear? Keep up the fantastic work and thanks for brightening the world with your gifts! Thank You Joan, Joy, Lilah, Kim , Heidi and Tonya !! Hope you feel better soon. Hearts to me are the symbol of all the people who mean so much to me. I have loved hearts since I first saw my mother's charm bracelet from the 1940's and have collected them for many years. I'd love to win one of yours. Put me down for a bonus point as I'm mentioning on facebook. Good luck everyone--but I think it needs to live in Canada with me! Such a beautiful necklace, I would so LOVE to own it. The heart is such a powerful symbol of love of all kinds, not just a romantic love. It can symbolise love for a child, parent, pet, the world - anything. The shape of the heart always makes me smile. I already follow your blog, facebook page and twitter feed. Thanks for the chance. So COOL! Thank You Connie, Jeannette, Anna and Donna !! This is just beautiful! It would be an honor to wear this. PS - don't you love Brenda's book? She was a fantastic teacher. Loved the ring you made, of course, a heart! Sandi, I need an email or contact info in case you win. Good Luck ! What does the heart mean to me. Hmm. At one time, it meant tragedy and longing. I thought I'd never pull out of that darkness and felt like I'd lost my heart, because something that broken, that shattered, surely had just disintegrated and been blown away by the wind. But then the heart began to mean hope, and hope bloomed into love again. The new heart is battered, has stitches, has some locked doors, but it's still beating, stronger, in spite of and because of love. I am happy to know that your heart is strong and loving again. I think that having a heart with some stitches makes it even stronger. Que afortunado el ganador de tu corazon! Es hermoso, no solo estéticamente, sino también por el lindo simbolismo que contiene! I love this necklace! The colors and the beautiful flower. For me the heart can have so many different meanings...love, health, happiness, longing, friendship, I could go on and on. Lorena, what a stunning piece! For me, hearts have always been closely tied to my identity. I grew up loving Valentines day- "Valentine" is my maiden last name, and the activities surrounding the day always made me feel very unique and proud of my family. Later in life, Hearts have come to symbolize resilience. Women in my family are stricken with heart disease in mid-life; watching my mother survive a heart attack in 2006 and then push herself to recover, coming back stronger than ever showed me the power behind the heart symbol. it can also stand for brazenness, passion, and a desire to live to the fullest. I am very happy to know your mom is doing great. Thanks for sharing this story with us !! For me the heart represents many things...Love, life, strength, passion and that every second a heart beats is a precious gift. Now, I'm going to post this giveaway on my Facebook ! Thanks for the chance, Lorena. Gorgeous! The heart symbol means life and love. Your work is just lovely! To me, a heart means love and devotion - something that EVERY person has the ability to do! My email is in my profile. Thank You Lydia, Judy and Taleah !! What a fabulous giveaway. I'm addicted to the corazon, and your necklace is beautiful! Well, I don't know how I missed this but you know I love your work. This piece is stunning. The heart, especially the sacred heart is so important to me. Jesus=love. That says it all in regards to the heart! Thank You Dayna and Judy !! Thank You Deryn !!! ;D I agree with you ! To me, the heart symbolizes the soul of a person, the center of all feelings. Thank You Pat and Delia !! Oh Im so behind news! There are soooo many things in life that will catch your eye, but only a few will catch your heart..